Price of Independence | Irene Abdou Photography, LLC - Travel. Lifestyle. Documentary. NGOs, Development & Public Health. 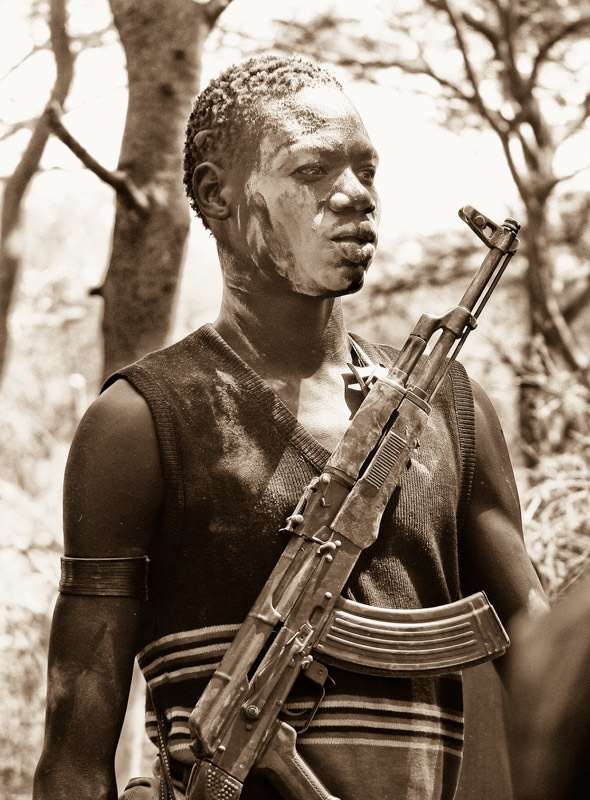 A young Dinka man in a cattle camp keeps his AK-47 close. This photo illustrates the commonality of weaponry, even in remote cattle camps like this one. South Sudan has endured generations of civil war - a Comprehensive Peace Agreement between the Government of Sudan in Khartoum and the Sudan Peoples Liberation Movement was signed only in January 2005. Despite the peace agreement, ordinary people - men, women, and children - carrying their AK-47s in the market or on main roads is a common sight. Given this context, gunfights in bars - or even between families during civil disputes - are also "normal." Particularly in ethnic Dinka areas, where Dinka sub-tribes traditionally clash, carrying an AK-47 or other firearm is simply a means of protection.